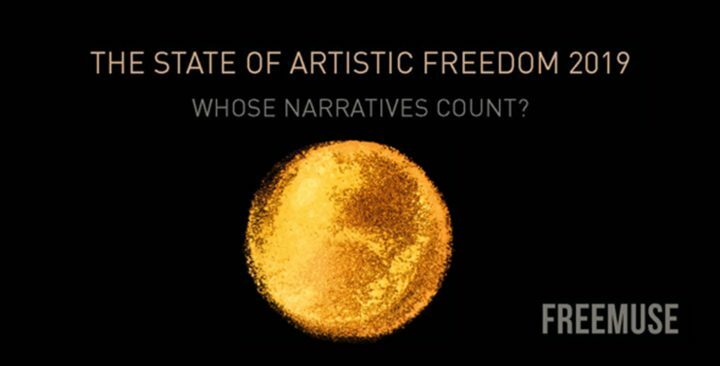 On March 26, 2019, Freemuse, the world’s leading independent international organization advocating for and defending freedom of artistic expression, launched its annual report, The State of Artistic Freedom 2019: Whose Narratives Count? 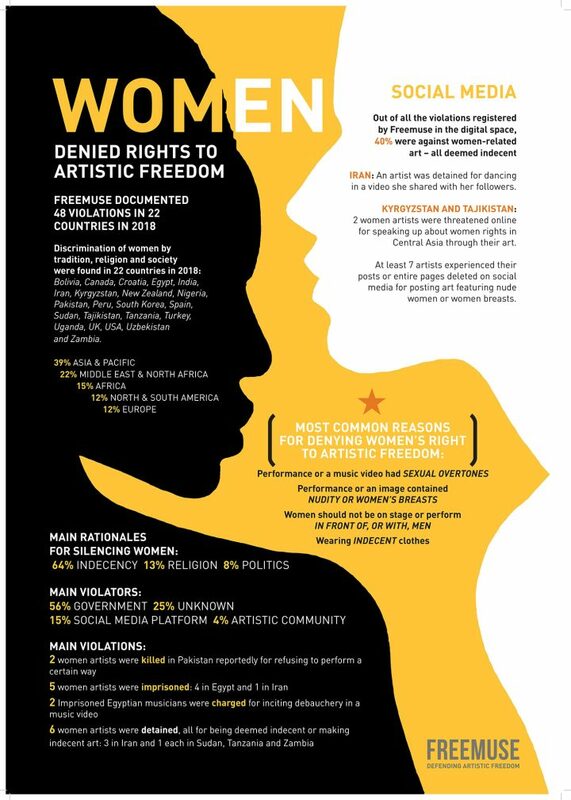 Freemuse’s annual State of Artistic Freedom report serves up a total of 139 pages of content, all based on research assembled from monitoring, documentation, and examination of violations of artistic freedom and other legal and policy developments worldwide. 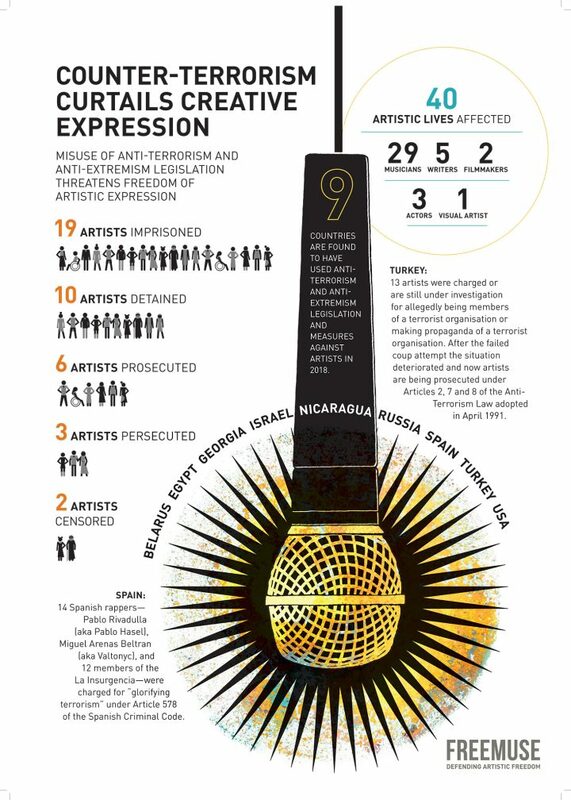 Some of the most severe violations of artistic creativity in 2018 occurred in those autocratic countries which systematically limit freedom of expression, while their citizens are, contrary to the international human rights standards, exposed to unlawful prosecution, arbitrary detention and other forms of intimidation and suppression. In other countries, the practice of stifling artists mainly appeared as a mechanism for alleged protection of state laws, public morals, and social and religious norms. 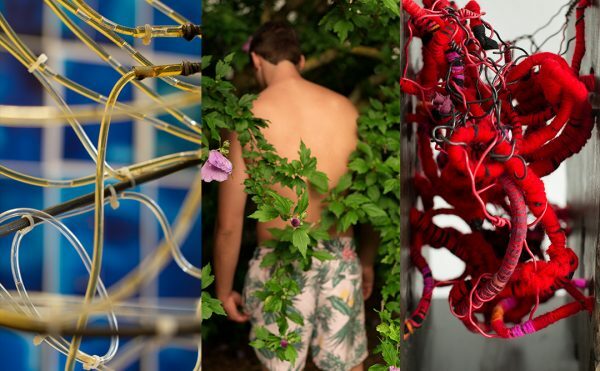 The report found that at least 157 artists were imprisoned or detained in 29 countries in 2018, with censorship active in at least 60 countries, which affected a total of 1,807 artists and artworks. 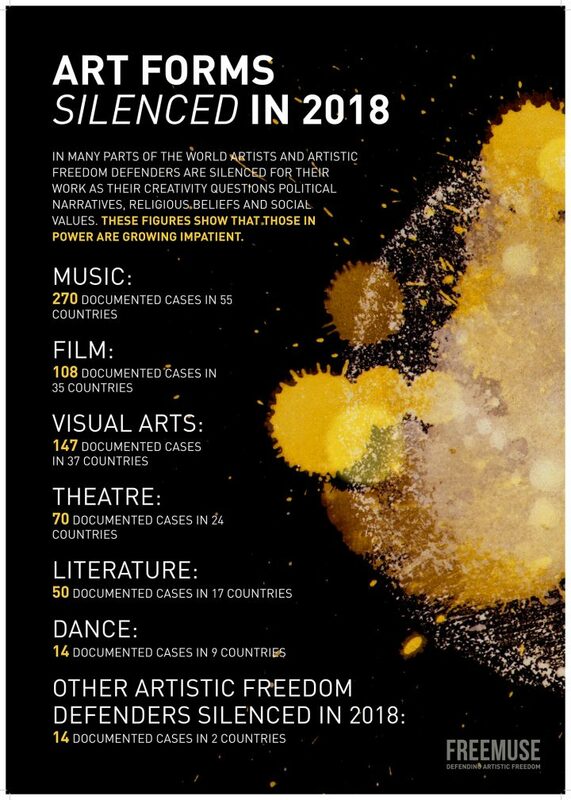 The art forms silenced and covered in the 2018 report include 270 cases of music, 108 cases of film, 147 cases of visual arts, 70 cases of theater, 50 cases of literature, and 14 cases of dance. 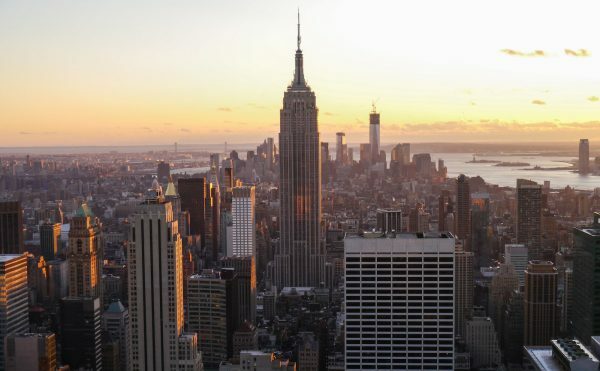 The report found the primary reason for censoring art and/or imprisoning artists is expressing alternative political opinions and being critical of government. 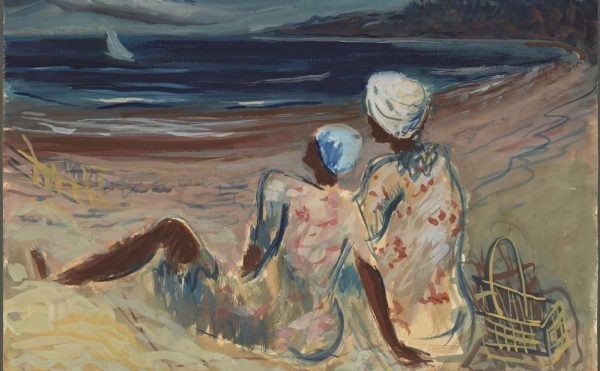 It found that while artworks and artists who challenged dominant social, cultural, and religious norms were targeted in 2018, a disturbing rise of anti-terrorism legislation was more regularly used to curtail free speech and expression, which increased in countries in the global north, such as in the USA and Germany. Of the 286 documented acts of censorship in the Freemuse report, 38% of cases came from countries in the global south, while the lion’s share, 62%, came from countries in the global north. The report also highlights the fact that women, LGBTQ people, and minorities remain, as they have for decades, at significant risk, frequently under physical attack. LBGTQ individuals, the report says, were attacked in 20 countries, with 56% of cases registered in countries that do not criminalize homosexuality. 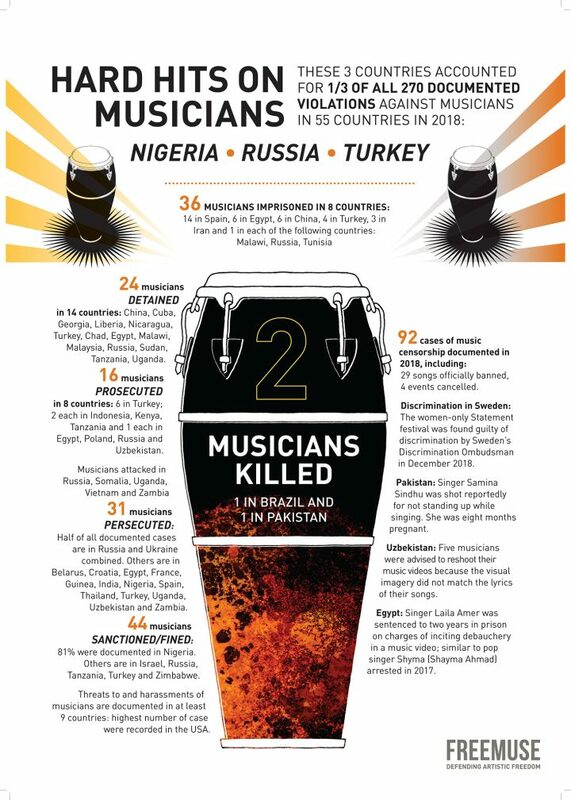 The Freemuse report covered a total of 157 artists who were either imprisoned or detailed in 29 countries in 2018. In terms of those imprisoned, the report found that countries in the global south led the way. 59% of those detained for making art, music, or film were from the global south, compared to 41% in the global north. 56% of cases were for art works or projects related to politics (mostly for criticizing governments); 18% were grouped into so-called counter-terrorism; 12% of those arrested or detained were offending religion; 9% of cases pertained to art made about being a member of a minority group. The report touches on the challenges of culture in conflict situations, citing examples like Russia and Ukraine, Palestine and Israel, and India and Pakistan, where artists often become targeted alongside journalists. A big take away from the report, however, is how “counter-terrorism” measures are increasingly being used to curtail artistic and cultural output, not only in the global south, but also, critically, in the global north. The report describes a “misuse of anti-terrorism and anti-extremism legislation” that threatened freedom of artistic expression worldwide. Citing a number of cases, the report says that “while governments use restrictive and questionable cultural policies that serve as a defence mechanism against those considered as enemies or supporting enemies,” there are also a number of other tools governments and others use, including “diplomatic channels to silence their own artists from spreading messages abroad.” For instance, 14 Spanish rappers were charged last year for “glorifying terrorism” under Article 578 of the Spanish Criminal Code, a move that Freemuse cites as an example of exorbitant oversteps of anti-terror legislation in the global north. The report notes that Turkish authorities, for example, arrested a number of artists last year under vague anti-terrorism legislation. The Freemuse report foregrounds how artists in Turkey associated with the illegal Fethullahist Terrorist Organization (FETÖ), the outlawed Kurdistan Worker’s Party (PKK), or the pro-Kurdish Peoples’ Democratic Party (HDP), have all come under threat, leading to a widespread culture of censorship and repression in the country, which remains one of the most censorious in the world. USA — Land of the Free? 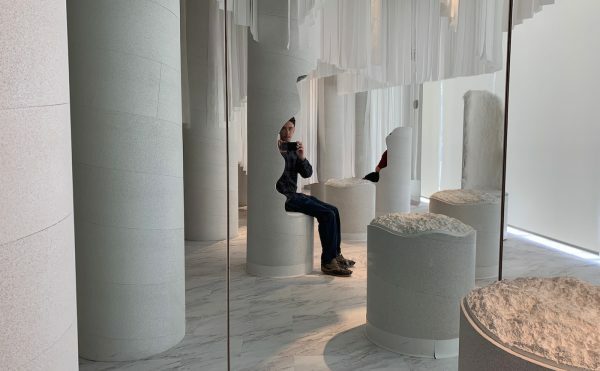 Freemuse highlights how art in the US with political content is often rejected by institutions for “fear of appearing partisan.” The report describes how certain artworks dealing with LGBTQ or racial issues are often the target of censorship within institutions. According to Freemuse, 70% of the violations of artistic freedom in the US last year involved some form of censorship. The report also cites the notorious “Visa Wall” affecting foreign artists’ movements. In April 2018, for example, two prominent dancers from the Russian Bolshoi Theater were barred from entering the US. The report, aptly titled “Whose Narratives Count?” concludes by noting that in many parts of the world “low levels of tolerance” are being “driven by anti-others politics.” Looking ahead to 2019, the report offers key insights into the extreme hyper-polarization of our times, predicting that artists will continue to face complex and multifaceted challenges, but that ultimately civil society organizations and nation states alike have a fundamental duty to uphold free speech and expression. The Freemuse annual report is a potent reminder that artistic freedom is in constant need of monitoring. 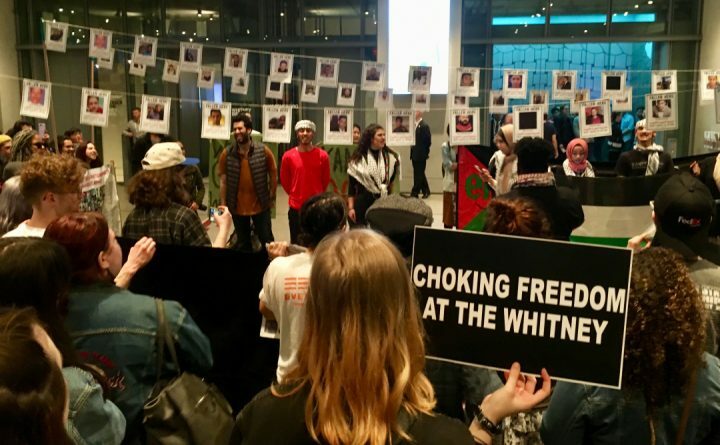 Whether in autocratic or democratic societies, suppressing human rights and expression of artists anywhere is an attack on freedom of speech, human rights, and artists everywhere. Freemuse is an independent international organization advocating for and defending freedom of artistic expression. See more at: www.freemuse.org.